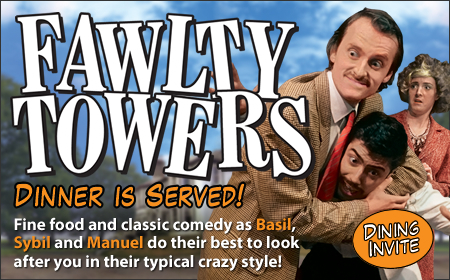 Join us for the dinner event of the year which combines fine food and classic comedy action as Basil, Sybil and Manuel do their very best to look after you the only way they no how. Chaos and mayhem are served in large portions and very likely to interrupt the proceedings, but all should end well, as the of hotel and catering management do everything they can to keep the evening on course! The Germans have booked the Function Suite Basil is not Happy!! The Health Inspector is going to pay a visit, and Manuel’s Hamster (Rat) is nowhere to be found. Expect a big fun night out in a friendly party atmosphere with some of the finest comedy actors in the land, professionally produced to the highest standards and with your enjoyment always at the top of the menu. A faultless show that guarantees to reach chuckle muscles you never knew you had!